PVDF (polyvinylidene fluoride) is a highly stable and pure fluoropolymer offering a unique balance of properties. This material has outstanding resistance to most mineral and organic acids, aliphatic and aromatic hydrocarbons, alcohols, halogenated solvents, and oxidizing environments. 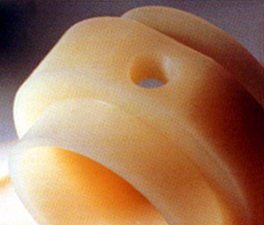 PVDF provides unique chemical resistance at elevated temperatures (300° F), particularly in the presence of chlorine, fluorine, or bromine. This material also has good weathering properties and excellent resistance to aging. It is available in a wide variety of forms, is nontoxic, and meets FDA and USDA regulations for direct food contact.